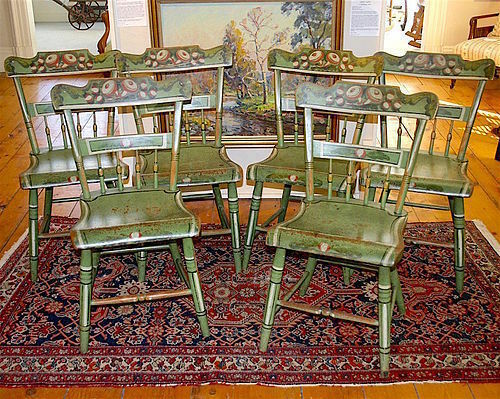 Matched set of six Hitchcock style dining room side chairs in an original green painted surface with bright floral painting. 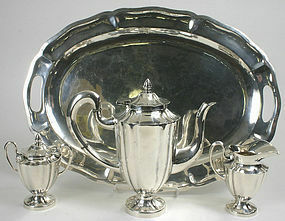 Circa 1830-40s. 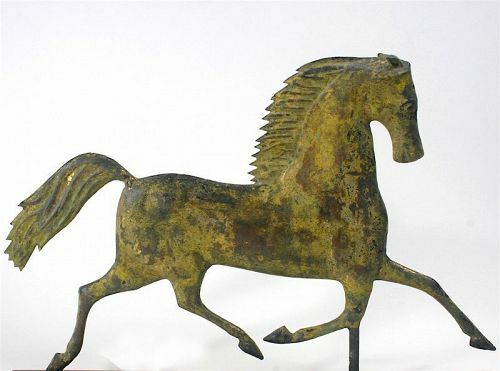 Dimensions: 32 inches H x 19 inches W x 18.5 inches D. Seat height: 17.5 inches. Structurally sound, with repairs to two of the upper crest rails, and with a sliver missing from one front turned leg. Great color and boldly decorated with bright floral sprays. 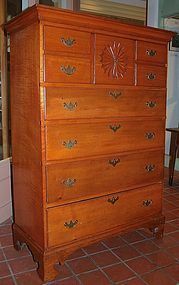 Hepplewhite period mahogany bow front chest with four graduated drawers, New England origin, c.1790-1800. Size: 40.75 inches wide x 22.25 inches deep x 36.5 inches high. Original brasses. 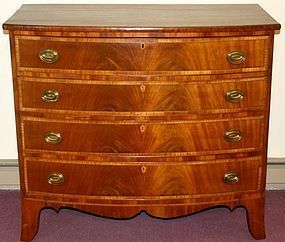 Each drawer is veneered in book matched crotch mahogany with satinwood cross banding. The high French feet flank a scrolled apron with checkered inlay. Old refinish. 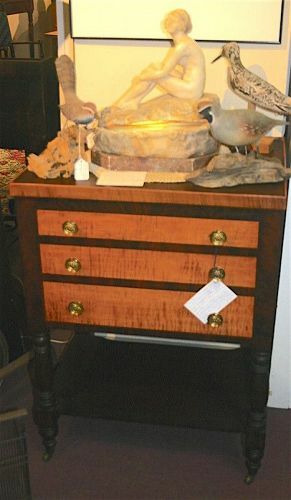 18th century New England round tilt-top hutch/chair table. Pine. Size: 46 inches diameter x 28 inches ht. Shoe feet, scrolled arms, sliding seat storage compartment in base. 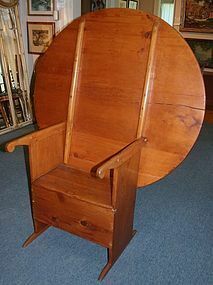 Top may be pegged closed as a table or hinged to an upright position in order to save space and used as a chair. The seat in the base slides out to reveal storage beneath. Condition: refinished but with an attractive mellow surface with old patch repair to top (see photos). Nice overhang allows for plenty of leg room. 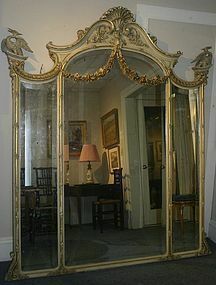 Ornate large Georgian style Chinese rococo gilt wood pier mirror with three beveled glass mirror panels, adorned with carved shells, floral garlands and ho ho birds. Age: late 19th/early 20th century. Size: 7 feet ht. x 5' feet 10.5 inches wide. Condition: some minor loss at edges of frame and to birds' wings. Some cloudiness to mirror. 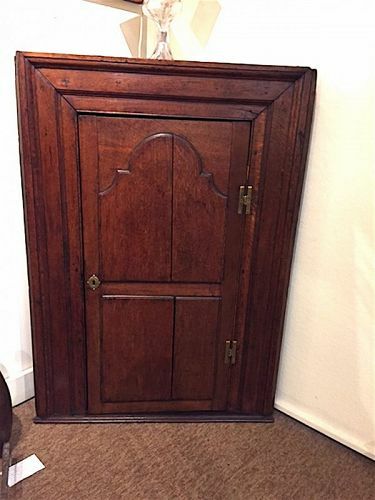 Victorian diminutive size secretary bookcase in walnut and burl walnut. Circa 1860-70s. Size: 83.5 inches ht. x 37 inches width x 20 inches depth. 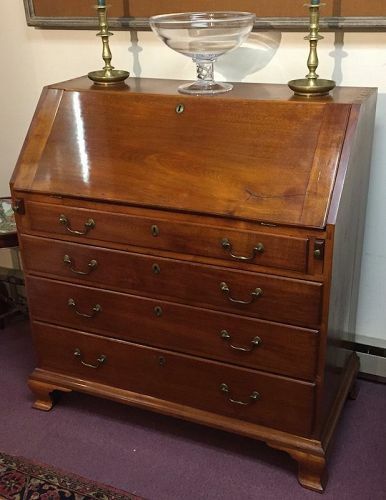 Excellent original finish and condition; found in a home in Northfield, Vermont. 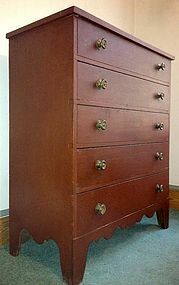 The lower section has a cylinder roll-top with burl panel, revealing a pull-out writing surface and cubby holes, above 5 drawers and a cupboard. The upper section has two glazed doors and adjustable shelves. 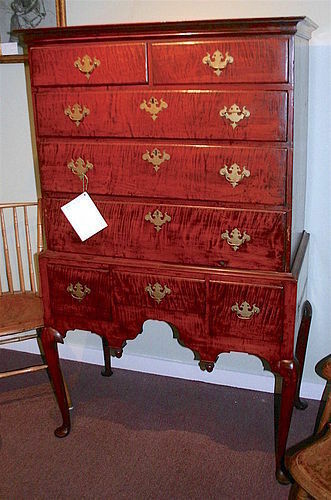 Antique red-painted country tall chest, New England, circa 1830. 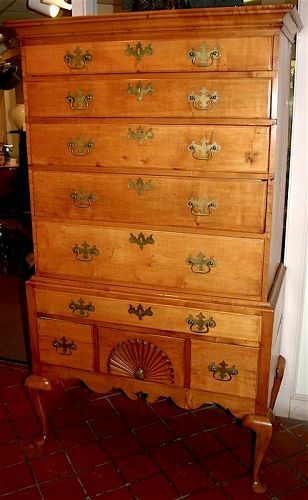 Pine with original red surface and original brass hardware. 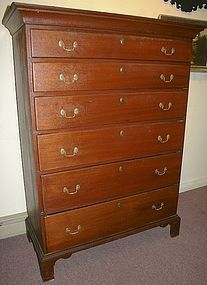 Five graduated drawers; high feet with unusual shaped, scrolled skirt in the front and sides. Size: 47 inches ht. x 38.25 inches width x 19 inches depth. Minor surface imperfections.